I have had a long love affair with words. Ever since I learned to read at 5 years old, I have loved to read them. I have always loved writing them in my diary or journal, and in more recent years, on my blog. I enjoy looking up their meaning and origin and learning new words. When I came into a relationship with Christ in my late 20's, I found that I had a love for God's Word as well.. Over the years that love of words, and especially God's Word, has grown into a deep love of studying the Bible and it's many words. Words enrich us. They educate us. They help us explain our thoughts and feelings and even help us to express who we are. I think that's why I fell in love with art journaling - taking the combination of image and creativity and words and using them all to express myself. It is out of all of this that I created Words Challenges. These challenges combine Bible study and creativity and give us a platform from which to express God's words to us in ways that connect with the creativity He has placed within us. What began as Advent Words in December 2017, soon grew into Lent Words in February-April 2018, and has now grown into Colossians Words beginning on August 1. In all honesty I think this one most excites me! Over the years as I learned inductive Bible study methods, and then went on to lead them in groups, I have grown to love going through an entire book most of all When doing this you get a much greater sense of the authors intent and meaning as you read and study it in its context. Every time I have gone through a study of a book of the Bible God has used that time to open His Word more fully. In fact, about 10 years ago our church shifted to a more expository approach to preaching and we have often gone through entire books of the Bible through our Sunday morning series. Time and time again we find that God shows us things in fresh ways as we go through an entire book. Words have the power to change us - especially the words that God has breathed to us through His Spirit through the Bible. I would like to invite you to join me, and a community of people that has grown to over 200 members, as we use 20 significant words from Colossians which will take us through the entire book. Each day, beginning on August 1st, there will be a devotional Bible study based on a word from Colossians. 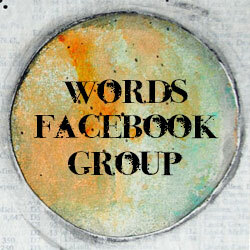 Participants are then encouraged to respond to the word and the Scripture passages in whatever creative practice you choose - art journaling, photography, Bible journaling, poetry, creative writing, etc. 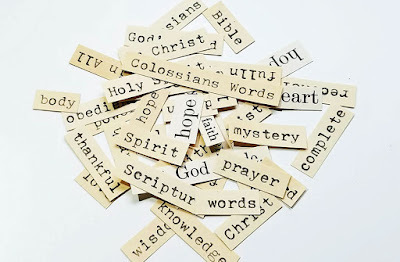 I am also a part of a group called Everyday Journals ~ Living Your Word of the Year, where the Colossians Words Challenge will be our theme this month. For the past few weeks a group of us have been making a journal just for this challenge in my first online class offered on my site. 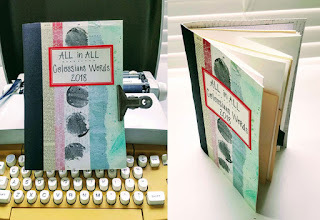 If you are interested in learning how to make a signature journal, you can learn more about it here: All in All Signature Journal Class. It's not too late to begin a journal for this challenge or to learn to make a simple journal for any project. Make sure you subscribe to this blog in the box in the sidebar in order to receive notice of the daily posts for the challenge.